When it comes to protecting the creatures they love, conservation scientists will not hesitate to get weird. Last year, for example, researchers in Australia dropped poison-laced toad sausages out of helicopters in an attempt to protect toad-eating marsupials (the poison made the animals puke, and taught them that cane toads—whose poison at full-strength will cause the marsupials to drop dead—are not for eating). 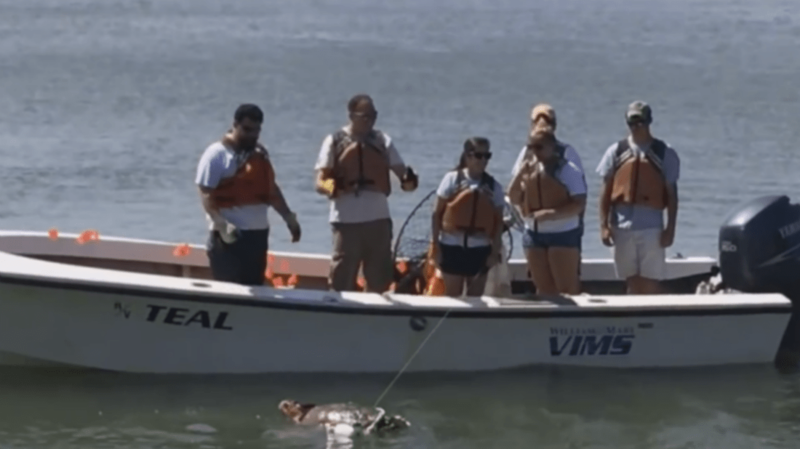 And now, researchers at the Virginia Institute of Marine Science (VIMS) have begun deploying Styrofoam-stuffed dead turtles to better understand those that are living. Here’s the grim situation: Every year, hundreds of dead loggerhead sea turtles (Caretta caretta) wash up on the shores of the Chesapeake Bay. Scientists aren’t sure why the turtles are dying, or even where, since their floating bodies can travel great distances on the current. VIMS marine scientists David Kaplan and Bianca Santos are working to get to the bottom of this tragic mystery. While 100 to 300 dead turtles are found on the beaches each year, there may be many more still in the Bay. In one experiment, Santos found that the average turtle body only remains intact for 3 to 5 days after death, which means that many bodies likely break down before reaching the beach. Kaplan and Santos don’t think all these deaths are random; they believe there must be areas of hidden danger in the Bay. If they can find those zones, they may be able to identify, and eventually help mitigate, the causes of the turtles’ death. Following in the footsteps of legendary scientists like, say, Viktor Frankenstein, Kaplan and Santos have decided to use the materials at their disposal. And by “materials,” we mean the beached bodies of two unfortunate loggerheads. The bodies, collected by members of the Virginia Aquarium’s Stranding Response Program, were brought to the lab, where the organs were removed. Next, the researchers filled the body cavities with buoyant Styrofoam, lashed the turtles back together with zip ties, and affixed GPS trackers to their shells. Styrofoam-gutted though they may be, the two Frankenturtles are still pretty hefty, weighing in at 150 and 70 pounds respectively. These Frankenturtles, as the researchers call them, represent one faction of a very strange army, which also includes two wooden-Styrofoam turtle models and a pair of customized buckets. The wooden turtles float, while the buckets drift along half-submerged, which should provide some insight into the way turtle bodies move at different stages of decay. The Frankenturtle cohort took its first test voyage in the bay from June 13 to 16. You can check out their trajectories on the VIMS Frankenturtle tracker website.